Putin’s draconian new laws – a sign of his limited options? 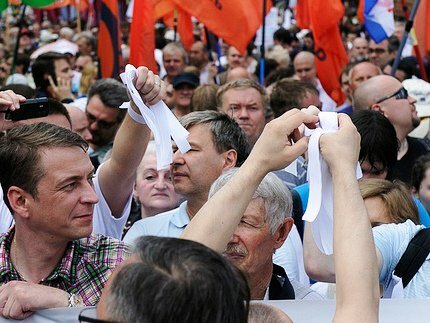 After previous repressive measures by the Kremlin, the ‘March of Millions’ in Moscow on 12th June was expected to turn ugly. Raids on leading oppositionists had many talking about another 1937 (the year of Stalin’s Great Purge), yet the expected provocation and police brutality did not happen. Julia Pettengill assesses the significance of this restraint. On one level, this was simply a wise strategic decision on the part of the Kremlin to avoid fomenting further popular protest, and unlikely to impact on the crackdown already underway against Russia’s opposition. Yet on another level, this act of tolerance indicates the bind that Putin has found himself in, with the erosion of his popularity and the resilience of Russia’s opposition movement. But while Putin may resort to Stalinist tactics, his “sovereign democracy” is not the same as the totalitarianism of the Soviet Union. Indeed, the unstable combination of authoritarianism, kleptocratic patronage and pseudo-democracy that underpins Putin’s power monopoly will prove increasingly difficult to sustain in the face of mass popular protests and growing public disaffection. A recent poll by the Kremlin-sponsored Public Opinion Foundation saw public trust in Putin fall from 55% in March to 48% at the end of May, a significant drop in only three months. Declining faith in Putin coincides with increasing support for political dialogue, with the independent Levada Centre’s new polls showing that 67% of Russians would like Putin to enter into a dialogue with protestors. Meanwhile, Russia’s opposition is taking advantage of the political momentum of the protests to assemble a viable political alternative to Putinism. The past seven months have witnessed an unprecedented display of unity and cooperation between groups spanning Russia’s ideological spectrum, as well as within ideological camps known for being riven by infighting and egotism. Opposition leaders, including veterans like Boris Nemtsov and Garry Kasparov and new generation activists like Alexey Navalny and Sergey Udaltsov, are pushing for a sustained, broad-based campaign aimed at forcing Putin to accept key political reforms. Following last Tuesday’s protest, this took the form of a ‘Free Russia Manifesto’, signed by opposition leaders including Nemtsov, Kasparov, Udaltsov and Navalny, designed to provide a roadmap for the protest movement to attain genuine political influence. The manifesto proposes the creation of an elected coordinating council of representatives from key protest constituencies, which would act as a rallying point and decision-making body for the movement. Individual parties and coalitions are working to develop pragmatic agendas to address public concerns, and are rallying behind selected “systemic opposition” (i.e. the parties permitted by the Kremlin) candidates in local and regional elections as a way of eroding Putin’s legitimacy and splitting the ranks of the elite. For his part, Putin can easily imprison oppositionists on trumped-up charges, and invoke numerous illiberal laws to brand these individuals and groups as extremists. But as Gleb Pavlovsky has noted, measures of this kind will only serve to cement ties within the anti-Putin coalition, and are likely to radicalise those who were on the fence about Putin’s hard-line tactics. ‘Solidarity’ representative Vladimir Kara-Murza has echoed this line of thinking, predicting that such tactics will “only increase the turnout at protests,” as a new generation asserts itself against this increasingly rudderless mafia state. This doesn’t mean that the Kremlin cannot, and will not, cause serious harm to the opposition with such tough measures. But Putin’s options have narrowed significantly, more so than anyone could have anticipated when the protests began in December. His unquestioned authority is no longer a given, and the fact that he retains control of the instruments of power - including the loyalty of the elites and state security, as well as a monopoly on the media - may not be enough to withstand this corrosion of the Putin myth. Make no mistake—Russia is unlikely to see the “Orange Revolution” scenario that Putin so fears any time soon. The opposition lacks the national power base to achieve this kind of outcome in the near future, and Russians are notoriously ill-disposed to any prospect of political upheaval. But seven months of sustained and coordinated protest - bolstered by the impressive turnout at last week’s demonstration - does not bode well for a system increasingly compromised by internal contradictions.